When I was a girl, my parents had an old 1950s hardcover of The House at Pooh Corner that they read stories to us from at bedtime. My family loved Pooh and all of his friends. When my kids were little, it was my turn to read from that battered blue book. So I was excited to hear that the charming country retreat where author A. A. Milne was inspired to write about Pooh for his son Christopher is on the market for £2 million (about $3.1 m). Let’s take a look! A. 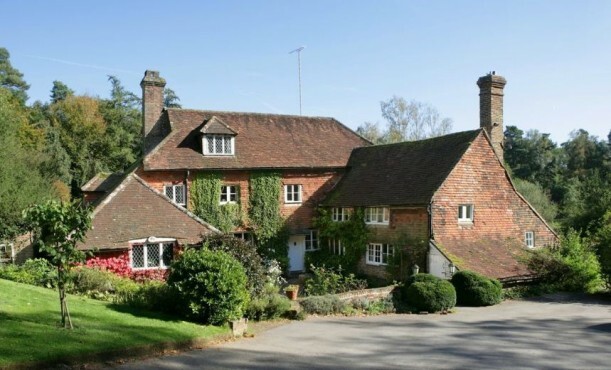 A. Milne bought Cotchford Farm in 1925 as a country retreat for his family. “It was here, amidst the beautiful Sussex countryside and surrounding woodland where the wonderful stories of Christopher Robin and Winnie-the-Pooh came to life,” the listing says. This 3-story, Grade II Listed Country House dates back to the mid-16th century (with later additions). The house has 6 bedrooms and 3 baths. It had another famous owner–Brian Jones, the musician and founder of The Rolling Stones, lived here until his death in 1969. The property sits on 9.5 acres. The garden has stone statues of Christopher Robin and characters from the Pooh stories. That’s fantastic! How fun to see the inside – it totally looks so very Pooh! What a wonderful place. You had me at Pooh, Julia…love this one! I am buying a lottery ticket today…if I win and buy the property, you are invited!! What a beautiful, charming home. I wish they had shown the poohsticks bridge! How wonderful to live in such a place! I loved seeing this house Julia, and one of the bedroom where the window is eye level to the bed must have been where imaginations went carefree and happy! It’s amazing – what a fairytale place to write such whimsical children’s stories! Although the English country setting and surrounds show up in the Pooh series, the real-life bear named “Winnie” that Pooh was based on was actually a Canadian bear from my home region in northern Ontario! Winnie, a black bear from the White River region on Northern Ontario, was purchased from a hunter by a soldier during the First World War and brought to England. I didn’t know that, Sarah! What an absolutely charming house! I have all four books, and to this day, Winnie The Pooh is my all-time favorite!! Brian Jones actually died *at* Cotchford Farm – he drowned in the swimming pool under mysterious circumstances – thus the famous “death by misadventure” coroner verdict. So enchanting! Thank you for sharing this today. Wish I had 3 million! That is my kind of house! The one and only thing I would change is the kitchen. I was kind of bummed when scrolling through the photos of old beamed ceilings, paneled walls, rustic brick, to all of a sudden track lighting, light colored blue tiles and blonde cabinets. The kitchen just seems out of place to me. Still love the house though!! I totally agree about the kitchen!! It looks SOOOO out of place! I like the configuration, but all the cabinetry and tile would have to be replaced for me to be happy. LOOOOVE the house, though. Really delicious. Love the antenna on the chimney. If I win the lottery, and purchase this house, you are all invited for a visit! How fun would that be! I’m sure you all would give me lots of advise on how to redo the kitchen!! It’s definitely in a beautiful part of the country, but as Pamela pointed out, Brian Jones died in the swimming pool, and I think that might put me off (oh, and the fact that I don’t have the required £mmm). Beautiful house. The ceilings seem so low though! With a house that old,( and any house that’s old,) someone’s bound to have died over the centuries. Women in childbirth and older folks and people with pneumonia etc… The fact that someone had died there wouldn’t put me off. Unless it was haunted! Now that’s another story! I love Winnie the Pooh. It’s one of those cartoons that will remain a classic forever. What a neat place. All I can think about is how cool it would be to go exploring around the whole property. Especially in that forest. A. A. Milne’s son was so lucky to have lived here. Thank you so much for posting this, Julia! I, too, have had a soft spot for A. A. Milne’s stories, and read them to my own children now. Wouldn’t it be fantastic to raise your kids in Christopher Robin’s old stomping grounds? Even though I can’t afford even a fraction of what the house is selling for, it’s fun to imagine! Love that house! I could live with the kitchen. It’s nice but doesn’t really go. Come to think of it, I might rip out the cabinets and change it to “unfitted”. It’s a great size. Beautiful place overall, and certainly a couple of very interesting and very different inhabitants! I LOVED this! My maiden name was Milne (no relation, I think) but I always wanted to see where he lived. Thank you so much for showing us the house!!! I need to win the lottery ASAP! I want that house (well, all except the kitchen :-0)! That’s a great old house that looks like it could date back at least a couple of centuries. I never heard the stories as a child and I was grown when the Disney cartoons began, but every time the subject comes up I start humming the great Kenny Loggins song “House on Pooh Corner”. I’ll probably have it in my head until bedtime. Dreamy! THAT would be the most lovely place to live, raise kids, explore, and dream. I sure wish I had 3 million lying around. I could walk those grounds daily and never tire of it…. Lovely except when they try and modernize older homes. It sticks out like a sore thumb! I like up to date wiring and furnaces etc, dry roof but they seem to really mess up when it comes to kitchens. I love the old cupboards that came with a house. This suits my fantasy pretty perfectly. Except for the kitchen – too jarring, like you left one world and walked into another. Just too modern with those fitted cabinets. And that’s a huge sleek range, but where’s the Aga? But, if I could afford it, I could afford to re-do the kitchen. However . . . Thanks for this one – it’s a real treat. How beautiful! I can just see A.A. Milne sitting in the study, writing away. I would love to get a hold of that kitchen as well! Thank you for sharing! Oh I love Pooh and all it’s sayings and the story. If you don’t mind, I’m going to use this post as a shout out for you and to expound on the sayings I’ve loved all my life from the book. Julia, you rock, and I just love your site!!!!!!!!!! I know that Brian Jones lived in this house, but was this the house that Denny Laine from Wings also brought when he married Jo Jo?